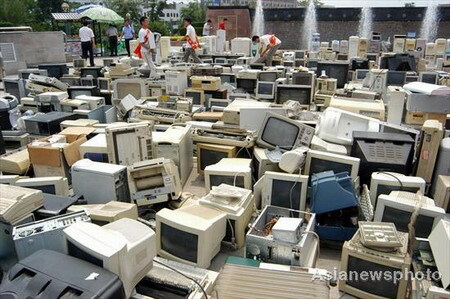 China on Wednesday approved a draft law on the management of electronic waste, aiming to reduce the pollution it causes. The proposed regulation on the recycling and treatment of used electronic products and home appliances received approval at an executive meeting of the State Council, China's cabinet. The country will set up a mechanism to encourage recycling and centralized treatment of electronic waste. This will be supported by a special fund, according to the proposed law. It also stipulated the respective responsibilities of manufacturers, retailers, repair and customer service providers and recycling companies in regards to the collection and treatment of electronic waste. These included used TV sets, refrigerators, washing machines, air conditioners and computers, among others. The draft was approved following years of debate over the issue in China, whose 1.3 billion people and rapid improvement of living standards made it one of the world's major manufacturers and consumers of electronic products. With the rapid economic and social development and improvement of people's living standards, electronic waste has increased largely. It was therefore necessary to make a special law to regulate the treatment of such waste to encourage a better use of resources, while preventing and reducing environmental pollution, according to the meeting. The meeting also approved a draft on the import and export of "genetic resources" of livestock and poultry. It aimed to promote the "sustainable development of China's animal husbandry" sector. The regulation stipulated certain conditions where the import and export of the resources could be allowed, and the cooperation between Chinese and foreign researchers could be approved.